With a blog named Writerly Goodness, what skill do you think I’m talking about? That’s right: writing. I have personal experience with this. My writing skills have consistently been one of the reasons I’ve been successful in internal assessment processes for advisor and consultant positions. I’m happy to announce I’ve once again been “called up” as an acting consultant in business expertise. Yes, Mellie is once more BEC-a-licious 🙂 BEC-and-call girl? Aw, BEC it. I’ll have much to report in the coming few months. And my writing skills? Yup. Crucial to the promotion. You don’t have to take my word for it, though. The good people at Grammarly, the world’s best grammar checker, surveyed over 400 freelancers to determine what impact writing skills have on a person’s career opportunities and published the results in an infographic (see below). It has already been picked up by some websites, including The Huffington Post. 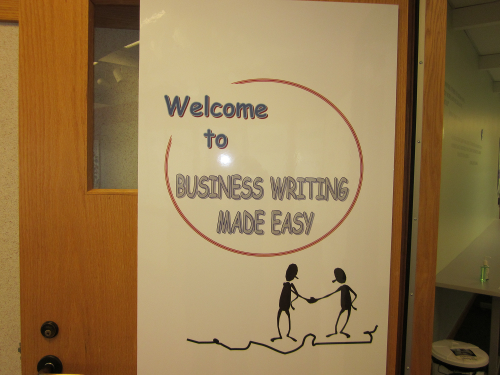 Their goal is to raise awareness of the importance of good writing. Good writing is not only foundational to good communication, but it can also unlock knowledge, job opportunities, and access to education. They’re also doing good work with Reading is Fundamental, a charity that promotes literacy. Good night, my writerly peeps, and good grammar. Back in November, I co-facilitated a team building course called Putting the Team First. I haven’t blogged about it until now, well, because NaNoWriMo, and Christmas shopping, and other stuffs. So here’s my first learning and development related post in, like, forever . . . I attended the training for trainers (T4T) version of the course back in December of 2013 and one of the first things we needed to get straight was the name of the course. People were calling it Putting Teams First. The designer (who was also one of the trainers) was very specific on this point. It’s Putting the Team First, thank you very much. Why so picky? Because that’s the focus of the course, to improve performance, one team at a time. We put the team first and each class focuses on one team, the entire team, if possible. The T4T was being delivered to train regional advisors and consultants in the material and methodology because our internal college, which is national, was handing off delivery of the course to the regions. While I had scheduled multiple sessions of the course for each sector in Ontario throughout the year (in my former capacity as training coordinator) this was the first occasion I’d had to deliver the course in the year since I’d received the training. So, I jumped at the chance. The theme was a nautical one and the one-day course was divided, as usual, into modules. The introduction was Boarding, followed by Packing for the Journey, The Crew, and Under Full Sail. Boarding dealt with the usual icebreaker activity, establishing trust, and navigation (the agenda) for the course. Packing involved identifying issues that the team faced and prioritizing them according to what could be addressed by the team (cargo), what was negotiable (dock), and what was out of the team’s control (warehouse). We also did a fun exercise on prioritizing salvage in the event of a shipwreck. The team had to work together to come to a consensus regarding what the most important items would be. The answers were prioritized by the Coastguard including rationales for each. The crew moved on to Tuckman’s Model. I’d encountered it before, but it was never given its proper name. For those who don’t know, Tuckman’s is the model of group dynamics that includes four stages: forming, storming, norming, and performing. Some thought was given to where the team thought they were on that continuum, but we didn’t belabour it. We also delved into team player “types” with an emphasis on the fact that everyone is a mixture of all four identified types, but that one manner of “expression” may be predominant. 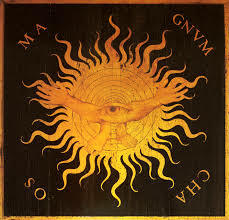 The four types were contributor, collaborator, communicator, and controller. Participants identified themselves and gave some thought to how tasks might best be allocated based on the strengths of each type. Finally, in Under Full Sail, we returned to the issues identified by the participants back in the Packing module and the team had to once again work together to create an action plan to address their most challenging issues. The idea is that the team will have the tools that they need to take action on their plan after leaving the course. We don’t check up on them, however. It’s entirely up to the team to take the information and run with it. So that’s what a day of team building is like where I work. What kinds of team building training have you facilitated? Participated in? What did you think? Constructive Written Feedback: Mission Impossible? So, I’ve been writing this course for about the past month. 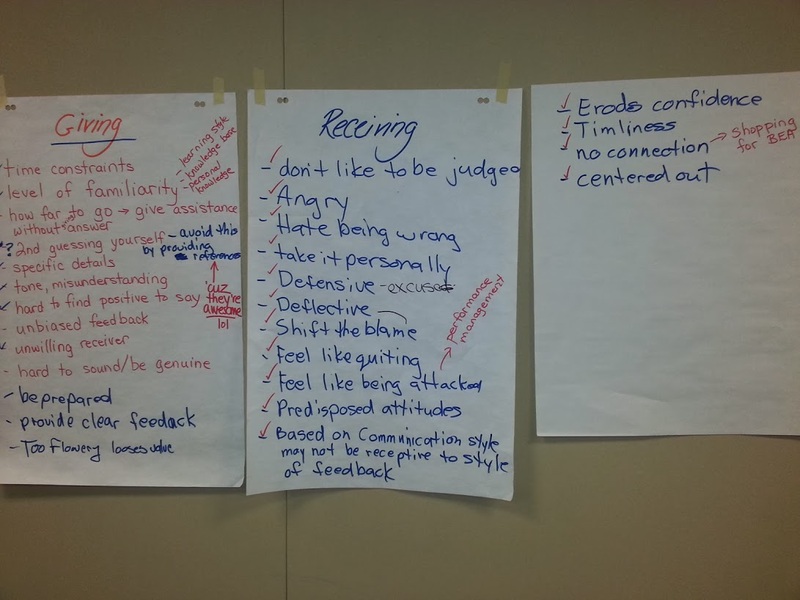 All of our feedback training, in house, consists of how to give verbal feedback, in person. In our virtual workplace, where much of our feedback takes place over email or through instant messaging, a new approach was recommended. Special funding was obtained to create and pilot this course, and a second one defining our monitoring process and how it’s changed with the advent of performance management, which two of my colleagues undertook. Last week, I had the opportunity to stand and deliver. The session started out with an introduction by my manager, who also presented me with my long-awaited trainer certification. You may remember that I achieved my trainer certification last March. The actual, suitable-for-framing certificate was almost a year in the coming. I have it now, though. I’ll take a picture and share once I’ve had the dear thing framed. I’m a bit of an accomplishment junkie. I frame every certificate of completion, award, or acknowledgement of completion I get. The wall at work is getting a little crowded. Like my C.V. on this site, my certificates are a concrete reminder of what I’ve done. My manager also advised the team that we had been nominated for a service excellence award for our collective work on the recent new hire training. We’ll see what comes of that. 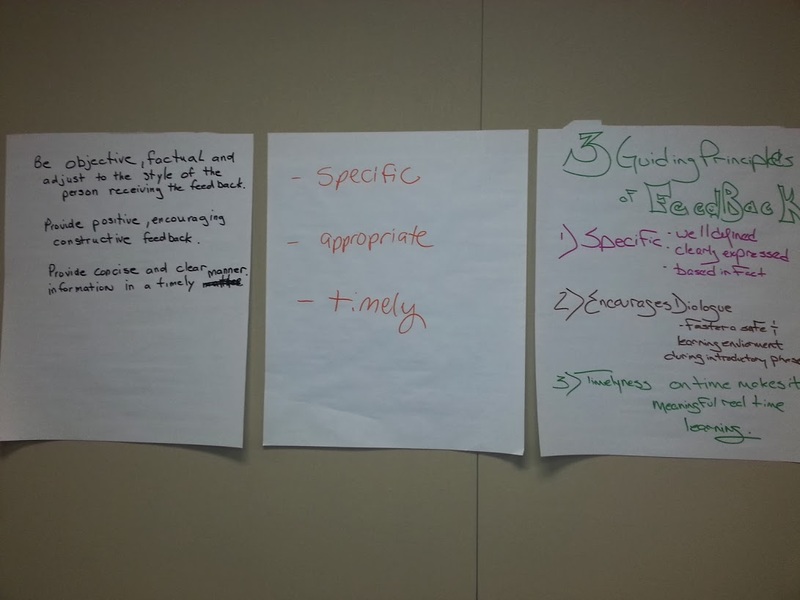 The course itself was designed in a participant-centered format with lots of activities. I also tortured them with a pre-course activity, asking them to write four different types of written feedback specific to our positions. What do we already know about feedback (brainstorm)? Is this knowledge applicable to constructive written feedback? Icebreaker (two truths and a lie). Rhetoric, a skill we don’t know we use every day. How to tailor our message to our reader. The four kinds of feedback (demonstration). The challenges of giving and receiving feedback (marketplace). The results of the challenges of giving and receiving feedback activity. How perception affects our feedback. The three principles of constructive written feedback (discovery). The results of the three priciples of constructive written feedback discovery activity. Recurring issues and a five-step strategy to address them. Practice in making our messages clear, concise, and readable (large group, cooperative). Critique of the (anonymous) pre-course assignments and presentation of highlights (small group). Knowledge transfer – participants made a promise to themselves in the form of tasks allowing 28 days of practice to create new habits with respect to constructive written feedback. The best part of the facilitation was eliciting the fabulous and valuable group discussions we had. My questioning techniques were certainly given a workout. I had handouts, a PowerPoint presentation, a poster, and a facilitators’ guide, but conspicuously, no participant guide. All of the learning content arose from the class and a several points, participants were asked to capture the information generated from various activities and report back to the class. My colleagues’ presentation on Monitoring: Beyond the Basics was informative. At our level, we haven’t had much in the way of structure or procedure. Many of us started the job by being thrown into the deep end and learning by doing. Yes, there is a course intended to introduce us to our job duties, but that is general in nature and geared to our position across business lines and departments. Our new procedures, flow-charts, and reports will give us that much-needed job-specific structure, moving forward. We might even be delivering the written feedback and monitoring courses to all new and acting advisors in the future, in-person or virtually. Who knows what will result from this past month’s work? One thing for sure is this: I’ll let you know. 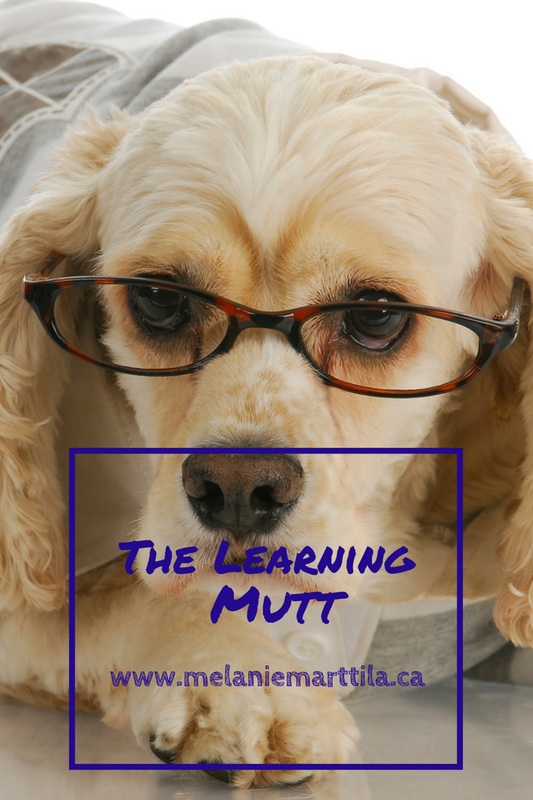 This is the learning mutt, signing off for today. Just a quick note about work. A scant three weeks after beginning my second acting consultant position, it has ended. Once again, my acting was based on a series of circumstances. Think of them as dominoes, if you will. One of the dominoes decided not to fall, and so I am once again an advisor on the training team. It’s been three frenetic weeks of planning next fiscal’s learning for not one, but two different business lines, creating third quarter reports, weekly reports, financial reports, etc. Frankly, I’m a bit relieved. Though I had made the determination not to take things quite so seriously and not to be such a perfectionist about my work, I just can’t do less than my absolute best. This was why I needed a leave after my year and several months in the position. The way things were going, I’d probably need another leave in the spring after my acting was scheduled to end (March 31, 2014). My pool has now officially expired, however, and I haven’t seen another posting for consultant that I can apply for. I did apply for a senior project officer, but I haven’t heard anything from that application yet. As a result of that one domino’s misplacement, the training team is now in a bit of a bind. Due to a significant amount of hiring, my manager has over thirty staff to supervise. And all the training and monitoring to arrange. And several other projects to implement before March 31. She’s advised me that she’ll be leaning on me heavily, so I’m sure things will be interesting. I’ll let you know what I can in the coming weeks. Next week, I start mentoring monitors and assisting in the design of several action plans. The week after, I’m away observing the Advisor Curriculum course so that I’ll be able to train it in the future. After that, we’ll see how things go.